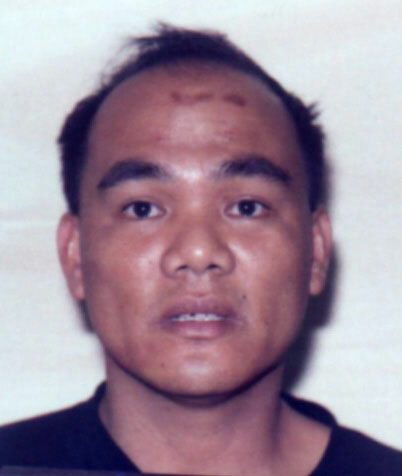 Kona Criminal Investigation Section detectives charged a 36-year-old suspect with a variety of offenses Thursday (January 11, 2001) after an incident the day before in which he wounded a police officer responding to a domestic abuse call. The suspect, Dino Healer, also known as Dino Vallente, of Waimea, was charged at 5:30 p.m. with seven counts of attempted murder, one count of abuse of a household member, one count of second-degree assault and three counts of terroristic threatening. He is being held at the Kona police cellblock in lieu of $431,000 bail and was expected to be arraigned Friday morning in the Kona District Court. The incident began at 8:09 a.m. Wednesday when Waimea police received a call of a domestic dispute in the Lakeland subdivision of South Kohala. The initial report indicated that a female had been struck in the head and nose and that her husband had locked himself in the bedroom with a knife. Upon arriving at the scene with fire rescue personnel, police found the woman leaving the house with a bloody nose. After directing her to the rescue unit, the officers entered the house and identified themselves to the suspect locked in the bedroom. As the officers were walking down a hallway, the suspect burst open the bedroom door and charged them with a large knife in his hand. The assailant slipped and fell to the floor, however, then stood up, ran back with the knife into the bedroom and shut the door. After securing the scene, the responding officers called for backup. After attempting to talk the suspect into giving himself up, they then called for a crisis negotiator. The negotiator talked to the suspect from outside the house and talked him into throwing a knife outside through the window. The negotiator then entered the house and showed the knife to the officers inside. The officers discovered that the knife didn’t resemble the one they had seen with the suspect in the hallway. The officers again tried talking the suspect into surrendering, but after the man refused their repeated entreaties, the officers told him they were going to enter the bedroom. About 11:50 a.m., the officers forced the door open about two feet when it was stopped by a metal serving cart. As the officers tried to force the door open wider, the suspect jumped atop the cart and started slashing with the knife. The knife cut one of the officers on the top of his head. The injured policeman, Officer Matthew Paschoal, 30, was taken to the North Hawaii Community Hospital, where his wound was stitched and he was later released.